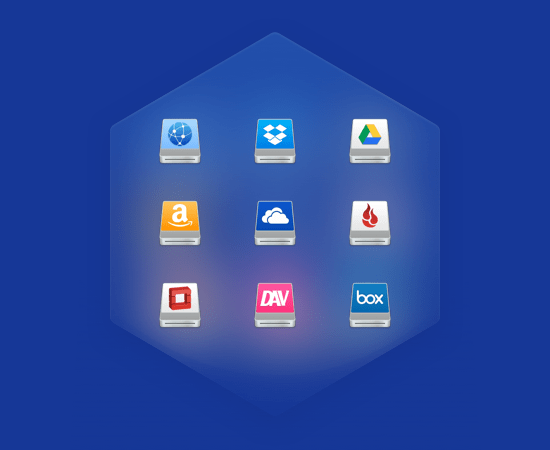 CloudMounter is a centralized solution for managing different cloud services and connecting to web servers. The cloud services are mounted on your Mac as if they were any other removable drive — OneDrive, Google Drive, Amazon S3, Dropbox, OpenStack, Box, Backblaze B2 are supported. FTP, SFTP and WebDAV servers can be connected to Finder as if they were located on your local network. You can also protect your online files with the encryption feature. The app is really simple — it looks like a connection manager where each cloud service and web-server are assigned to a key. Click the one you need and enter your login and password — that\'s it, the data is now accessible and manageable via Finder. You don\'t have to worry about security — your credentials are stored in Mac OS Keychain and sent directly to servers via encrypted channels. The most popular clouds — Dropbox, OneDrive, and Google Drive are available for free.